Our customers come to us because we make microscope purchasing easy and worry-free. Our customers are looking beyond flashy sales gimmicks and depend on us for 20 years of experience, unbeatable pricing, extensive selection, speedy delivery, and science know-how. Let Microscope World come up with the right microscope for you! You want customer service, and we have it! We are ready to help with any question and address your concerns. We have the expertise to help you find the best microscope for your money. There's no sales commissions and no up-selling, so don’t be surprised if we suggest a less expensive model. Read what our customers have to say about us. Our technical support staff is top notch and ready to assist you with any issues before or after your microscope purchase. 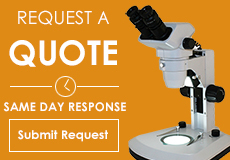 We invite you to ask us anything about the usage or the care of your new microscope. We also have a huge amount of online support material and provide a private comprehensive support and resource section exclusively for our customers. Microscope World has been providing top-quality microscope products since 1985. In our 20+ years, we've satisfied thousands of customers with quality science materials and microscopes for schools, industry and individuals. See a list of some of our customers. We are science educators and science people first and we know how to help! If we don't know the answer to your question, let us do a bit of research and try to solve your problem for you. We have done the footwork for you! We test and evaluate the microscopes we sell and give you the results. From our testing, we have become highly selective about the brands and models we carry. Our products must meet our high standards. If you aren’t happy, we replace it or refund your money. Read more about our testing. We offer a mindboggling selection of microscopes from three manufacturers: Meiji, Motic and National Optical. You can choose microscopes for every range of use from sturdy elementary models to precision lab instruments. 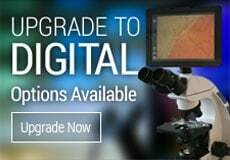 We offer digital microscopes for imaging applications and specialty instruments like the metallurgical microscopes used in reflected light applications. If you come up with something you can't find on one of our websites just call us. If we don't have it, there is a good chance we can either get what you are looking for or refer you to someone who may be able to assist you. Our microscopes are simply the best value for your money. On all of our high power student models we include a free DVD, "Adventures with a Microscope" and a super slide kit. We also have a password-protected section on our website that we will give you access to. This section includes many science activities and science information. Most importantly, we want you to be satisfied with your purchase - no one can beat Microscope World for our combination of price, value, and support. We want you to enjoy your microscope - whether it is for work or for play. In the rare case that your microscope is damaged during shipping, please call us and we will get a new product sent out to you immediately. If you are unhappy or dissatisfied with any product you purchase from us, for any reason, you may return it to Microscope World within the first 30 days of your purchase. (There are a few special order items that are not returnable - contact us for details). You will receive a full refund less the original shipping fees and insurance, when applicable. This assumes that the product is returned in new condition and accompanied by all accessories (instruction book, DVD, video, dust cover, original packaging, etc). Refunds are made by check and mailed within one week of the receipt of your return. If you plan to return a product, please call customer service at 1-800-942-0528.